Aspiration Biopsy, Fine-Needle; Carcinoma, Hepatocellular; Hep Par; Cell Block. Objectives: To study the cytological patterns of fine-needle aspiration cytology (FNAC) obtained from space-occupying lesions (SOLs) of the liver with an aim to differentiate primary hepatocellular carcinoma from metastatic deposits and to evaluate the added advantage and efficacy of studying cell blocks in conjunction with smears for enhancing diagnostic accuracy. Methods: This prospective study took place over two years (September 2007 to 2009) and included 61 patients with cases of liver SOLs that were clinically or radiologically suspicious for malignancy and who were referred for computed tomography or ultrasonography-guided FNAC. Smears were prepared from the aspirated material, and any remainder was used to make the cell block (n = 55). A final diagnosis was made after evaluating the smears and cell block sections. Results: On cytomorphology, a diagnosis of moderately differentiated hepatocellular carcinoma (HCC) and metastatic carcinoma was made in 10 (18.2%) and 25 (45.5%) cases, respectively, and were confirmed using cell block sections. In cases where it was difficult to differentiate between well-differentiated HCC and regenerative nodules, and between poorly differentiated HCC and poorly differentiated metastatic carcinoma, a final diagnosis was made with the help of cell blocks sections. Cell blocks assisted in reaching a final diagnosis in 16 (29.1%) cases. Cases that were diagnosed using cytomorphology were confirmed by the cell block method. In these 39 (70.9%) cases we were able to render a diagnosis with much more confidence. Conclusion: In our experience, difficulties in diagnosing SOL liver are attributed to differentiation of the tumor. Cell block preparation gives an additional advantage as architectural details can be studied that help to reach an accurate diagnosis in problematic and challenging cases. Thus, we strongly recommend the use of the cell block technique in conjunction with cytosmears for the purpose of diagnosis. Cell block preparation of liver aspirates is a useful adjunct to routine FNAC smears because multiple sections can be cut and immunohistochemistry stains and special stains can be applied, which can be of immense help in differentiating primary HCC from metastatic deposits in the liver. The gold standard for final diagnosis in difficult cases was Tru-cut biopsy. We sought to evaluate the accuracy of FNAC in conjunction with cell blocks for diagnosing liver lesions. This requires a clinicopathological correlation considering the results of smear cytology with immunostaining. Over two years, we prospectively studied 61 cases with space-occupying lesions (SOLs) of the liver that were clinically or radiologically suspicious for malignancy. Patients were referred to the Department of Cytopathology, Indraprastha Apollo Hospitals, New Delhi, for computed tomography (CT) or ultrasonography (USG) guided FNAC. Cell block was sufficient for interpretation in 55 of the 61 cases. Clinical details including history of pre-existing liver disease, biochemical data, serological markers, and radiological findings were recorded when available. Fine-needle aspiration (FNA) was performed under ultrasound or CT guidance, using a 21–23 gauge lumbar puncture needle by the radiologist as an outpatient procedure. No local anesthesia was given. Direct air-dried smears were prepared by a pathologist for routine Giemsa staining, and some smears were immediately fixed in 95% alcohol for Papanicolaou (Pap) staining. One smear of each sample was stained with Giemsa (Diff-Quick) for immediate assessment of the adequacy of the material aspirated and was examined under a microscope by a pathologist. After preparing adequate smears, the remaining material in the syringe was allowed to clot. Once the aspirated material clotted, it was fixed in 10% neutral buffered formalin for four hours. The tissue was then processed overnight in an automated tissue processor along with other routine biopsies. The block was trimmed and three-micron thick sections cut and stained with Giemsa, periodic acid-Schiff (PAS), and PAS with diastase. A final diagnosis was drawn after complete work up of the cases by the pathologist. Statistical analysis using the chi-square and Fisher’s exact tests was done to compare various parameters in the patients. A p-value of ≤ 0.050 was considered significant. Sixty-one cases with liver SOLs, clinically or radiologically suspicious for malignancy, were referred to the Department of Cytopathology, Indraprastha Apollo Hospitals New Delhi for FNAC. Following FNAC, six cases could not be interpreted by cell block due to either insufficient aspiration material for cell block formation, or scanty cellularity, crushed tumor cells, or blood only in the prepared cell blocks. In the remaining 55 cases, clinico-radiological parameters, cytological features, cell block examination, and immunohistochemical features were studied. A histopathological biopsy confirmation was done in 14 (25.5%) cases. The complete cytomorphological evaluation [Table 1] included study of cellularity, pattern of arrangement, cytoplasmic, and nuclear details. The useful cytological features in the diagnosis of HCC include trabecular pattern (p = 0.001) [Figure 1] with small capillaries traversing clusters of tumor cells [Figure 2], basket pattern (p = 0.005), benign hepatocytes (p = 0.000), hepatocytic appearance of tumor cells (p = 0.000), intracellular bile (p = 0.001) intranuclear inclusions (p = 0.000), macronucleoli (p = 0.000) [Figure 3] and atypical naked (stripped) nuclei (p = 0.015). In 10 (18.2%) cases, the cells had a very well differentiated cytomorphology and, therefore, it was not possible to give a definite diagnosis based on cytology alone. Similarly, in six (10.9%) cases the tumor cells were poorly differentiated and did not exhibit any particular differentiation. These cases would typically be reported as malignant. A final diagnosis was made using cell block preparation and immunocytochemistry. Use of a cell block helped in reaching a final diagnosis in an additional 16 (29.1%) cases. Table 1: Cytomorphological features of moderately differentiated hepatocellular carcinoma (MDHCC) and metastatic carcinoma in sample cases. Figure 1: Smears showing a trabecular pattern of cells with increased cord thickness in a case of HCC. Pap staining, magnification = 100 ×. Figure 2: Smears showing spindle-shaped endothelial cells noted at the edge of the thickened trabeculae of hepatocytes in HCC. Giemsa stain, magnification = 200 ×. Figure 3: Intranuclear inclusions in a giant tumor cell in HCC. Giemsa stain, magnification = 400 ×. There was a total of 10 (18.2%) very well differentiated cases, which were reticulin stained to determine the trabecular cord thickness [Figure 4]. In cases where the cord thickness was greater than three-cell thick, and there was a decrease in reticulin staining, a diagnosis of HCC was made. Based on these criteria, three (5%) cases were diagnosed as well-differentiated HCC and seven (13%) cases as regenerative lesions. Figure 4: Cell block section showing deficient reticulin framework in HCC. Reticulin stain, magnification = 200 ×. 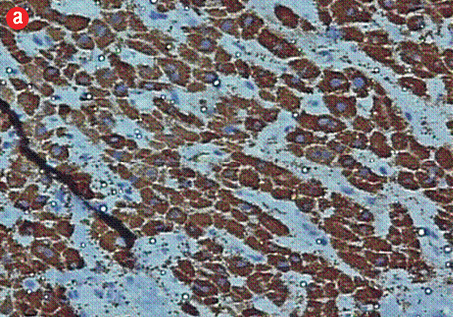 Figure 5: (a) Cell block section showing strong diffuse positive staining in poorly differentiated HCC (Hep Par-1 immunohistochemistry, magnification = 400 ×). 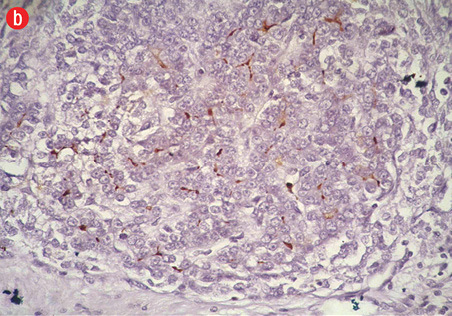 (b) Positive canalicular staining 13 with pCEA, confirming the diagnosis of HCC (magnification = 200 ×). Table 2: Immunohistochemical typing of poorly differentiated tumor cells (n = 6). PDHCC: poorly differentiated hepatocellular carcinoma; PDMCa: poorly differentiated metastatic carcinoma; HCCa: hepatocellular carcinoma. Hep Par-1: hepatocyte specific antigen; PCEA: polyclonal carcinoembyonic antigen; CK: cytokexatin. A follow-up biopsy was available in 14 (23.0%) of the 61 cases. 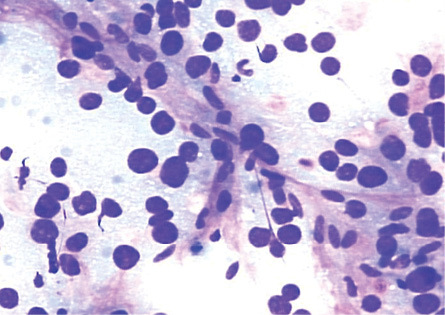 Of these, 12 (85.7%) cases were consistent with the FNA diagnosis: only two cases (3.3%) were inconsistent. One was reported as no evidence of malignancy on FNA and as a neuroendocrine carcinoma on biopsy, and the other was reported as inadequate on FNA and as HCC on follow-up biopsy. The age of our patients ranged from 32 to 90 years (mean = 58.8 years). The age of the patients with HCC ranged from 40 to 84 years (mean = 64.8 years). However, the age of the patients with metastatic carcinomas had a wider distribution ranging from 32 to 90 years (mean = 55.5 years). The female to male ratio was 4:6. Out of the total 55 cases with cell blocks generated, the status of viral markers was available in 35 (63.6%) cases. We observed a clear predominance of hepatitis B virus (HBV) infection in cases of HCC. On the contrary, metastatic carcinomas did not show any association with viral markers. Serum alpha-fetoprotein (AFP) levels were found to be >100 ng/ml in 10 (66.6%) HCC cases and one (14.3%) regenerative lesion case. None of the metastatic carcinomas showed significantly elevated serum AFP levels. However, a mildly elevated AFP level (up to 50 ng/ml) was seen in five (17.2%) cases of metastatic carcinoma. Thus, we concluded that although a mildly elevated AFP level can be seen in regenerative and metastatic carcinoma, a significantly raised serum AFP level is highly suggestive of an HCC. The history of a known primary was traced only in metastatic carcinomas (n = 11; 37.9%) cases. Differentiating poorly differentiated HCC from a poorly differentiated metastatic tumor is challenging. In our study, there were 29 (53%) cases of metastatic tumors of the liver: 25 were moderately differentiated, and four were poorly differentiated. AFP levels were not elevated in metastatic carcinoma cases. Useful features for differentiating HCC from metastasis include trabecular pattern with small capillaries transgressing clusters of tumor cells, hepatocytic cells, bile pigment, intranuclear inclusions, and atypical stripped nuclei. We used cell blocks to confirm the diagnosis of moderately differentiated (MD) metastatic carcinoma (n = 25; 41%) and MDHCC (n = 10; 18%) as determined by cytomorphology. Solid islands and trabeculae of hepatocytes thicker than three cells, rimmed by endothelial cells (i.e., basket pattern) was seen. This was confirmed with deficient or absent reticulin staining and further supported our diagnosis. In metastatic carcinoma, the cells had a cuboidal to columnar appearance and exhibited a glandular pattern. In histologically normal adult human livers, Hep Par-1 detects an antigen localized to the hepatocyte cytoplasm. No staining of bile ducts or other non-parenchymal cells was seen. The pattern is distinctly granular, occasionally ring-like, and is present diffusely throughout the hepatocyte cytoplasm without canalicular accentuation.20 Positivity for Hep Par-1 and negativity for CK7/CK20 strongly favored HCC over metastasis, and negativity for Hep Par-1 and positivity for CK7/CK20 confirmed the diagnosis of metastasis. Six cases had poorly differentiated morphology. 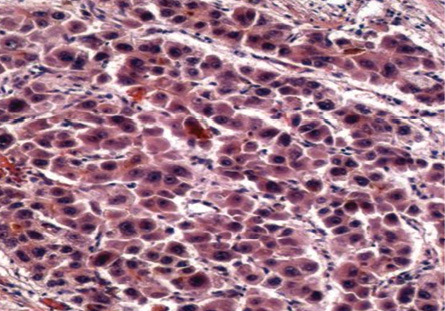 After immunohistochemical staining, a final diagnosis of poorly differentiated HCC was given in two (33.3%) cases, and four (67.0%) cases were diagnosed as poorly differentiated metastatic carcinoma. In one poorly differentiated case, reported as possible hepatocholangiocarcinoma, Hep Par-1 and CK7 was positive in the tumor cells, and polyclonal carcinoembryonic antigen (pCEA) and CK20 were negative. Hepatitis C virus (HCV) is the major etiological factor for HCC in the Mediterranean and South East Asia. In India, the prevalence of HCV-positive patients with HCC in previous studies was 4–10%.22 In our study the status of viral markers was available in 10 (66.7%) of the HCC diagnosed cases. Of these, six (60.0%) cases were positive for HBV and three (30.0%) cases were positive for HCV. In the regenerative lesions, the status of viral markers was available in five (71.4%) cases: three (60.0%) were positive for HBV, and only one case (20.0%) was positive for HCV. Out of the 20 (68.9%) metastatic carcinomas in which viral markers were available, a rare case of metastatic carcinoma was found to be positive for viral markers. This one case was seen in a patient with a preexisting HBV-associated chronic liver disease. The majority of patients with HCC as well as metastatic carcinomas were found to have solitary SOL on ultrasound and CT. Solitary SOL of liver was present in 10 (66.7%) HCCs and 19 (65.5%) metastatic carcinomas. However, in the regenerative lesions, multiple SOLs were found to be slightly more common (n = 4; 57.1%). In our experience, difficulties in diagnosing SOL liver are attributed to differentiation of the tumor and cannot be performed using cytological smears alone. Cell block preparation gives an additional advantage as architectural details can be studied, multiple sections can be cut, and cytochemical stains and immunohistochemical markers can be applied. Therefore, we conclude that the use of the cell block technique should be used whenever sufficient material is obtained from needle aspirates of the liver lesions, which will help to reach an accurate diagnosis in problematic and challenging cases and increase the diagnostic yield and accuracy. 1. Kramer H, Koëter GH, Sleijfer DT, van Putten JW, Groen HJ. Endoscopic ultrasound-guided fine-needle aspiration in patients with mediastinal abnormalities and previous extrathoracic malignancy. Eur J Cancer 2004 Mar;40(4):559-562. 2. Wang L, Vuolo M, Suhrland MJ, Schlesinger K. HepPar1, MOC-31, pCEA, mCEA and CD10 for distinguishing hepatocellular carcinoma vs. metastatic adenocarcinoma in liver fine needle aspirates. Acta Cytol 2006 May-Jun;50(3):257-262. 3. Saad RS, Luckasevic TM, Noga CM, Johnson DR, Silverman JF, Liu YL. Diagnostic value of HepPar1, pCEA, CD10, and CD34 expression in separating hepatocellular carcinoma from metastatic carcinoma in fine-needle aspiration cytology. Diagn Cytopathol 2004 Jan;30(1):1-6. 4. Zimmerman RL, Burke M, Young NA, Solomides CC, Bibbo M. Diagnostic utility of Glut-1 and CA 15-3 in discriminating adenocarcinoma from hepatocellular carcinoma in liver tumors biopsied by fine-needle aspiration. Cancer 2002 Feb;96(1):53-57. 5. Zimmerman RL, Burke MA, Young NA, Solomides CC, Bibbo M. Diagnostic value of hepatocyte paraffin 1 antibody to discriminate hepatocellular carcinoma from metastatic carcinoma in fine-needle aspiration biopsies of the liver. Cancer 2001 Aug;93(4):288-291. 6. Centeno BA. Pathology of liver metastases. Cancer Control 2006 Jan;13(1):13-26. 7. Sbolli G, Fornari F, Civardi G, Di Stasi M, Cavanna L, Buscarini E, et al. Role of ultrasound guided fine needle aspiration biopsy in the diagnosis of hepatocellular carcinoma. Gut 1990 Nov;31(11):1303-1305. 8. Cohen MB, Haber MM, Holly EA, Ahn DK, Bottles K, Stoloff AC. Cytologic criteria to distinguish hepatocellular carcinoma from nonneoplastic liver. Am J Clin Pathol 1991 Feb;95(2):125-130. 9. Longchampt E, Patriarche C, Fabre M. Accuracy of cytology vs. microbiopsy for the diagnosis of well-differentiated hepatocellular carcinoma and macroregenerative nodule. Definition of standardized criteria from a study of 100 cases. Acta Cytol 2000 Jul-Aug;44(4):515-523. 10. Limberg B, Höpker WW, Kommerell B. Histologic differential diagnosis of focal liver lesions by ultrasonically guided fine needle biopsy. Gut 1987 Mar;28(3):237-241. 11. Nasuti JF, Yu G, Boudousquie A, Gupta P. Diagnostic value of lymph node fine needle aspiration cytology: an institutional experience of 387 cases observed over a 5-year period. Cytopathology 2000 Feb;11(1):18-31. 12. Greene CA, Suen KC. Some cytologic features of hepatocellular carcinoma as seen in fine needle aspirates. Acta Cytol 1984 Nov-Dec;28(6):713-718. 13. Suen KC. 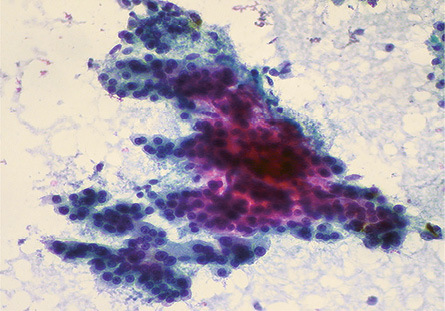 Diagnosis of primary hepatic neoplasms by fine-needle aspiration cytology. 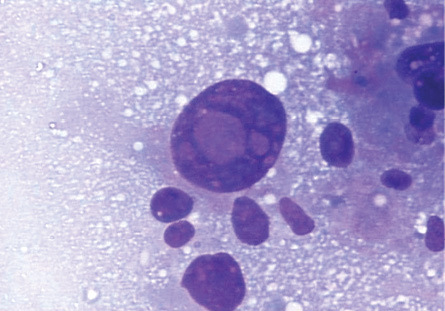 Diagn Cytopathol 1986 Apr-Jun;2(2):99-109. 14. Wee A. Fine needle aspiration biopsy of the liver: Algorithmic approach and current issues in the diagnosis of hepatocellular carcinoma. Cytojournal 2005 Jun;2:7-22. 15. Burt AD, Smillie D, Cowan MD, Adams FG. Fine needle aspiration cytology: experience with a cell block technique. J Clin Pathol 1986 Jan;39(1):114-115. 16. Ahuja A, Gupta N, Srinivasan R, Kalra N, Chawla Y, Rajwanshi A. Differentiation of Hepatocellular Carcinoma from Metastatic Carcinoma of the Liver - Clinical and Cytological Features. J Cytol 2007;24(3):125-129. 17. Chhieng DC. Fine needle aspiration biopsy of liver - an update. World J Surg Oncol 2004;2:5-12. 18. Caturelli E, Ghittoni G, Roselli P, De Palo M, Anti M. Fine needle biopsy of focal liver lesions: the hepatologist’s point of view. Liver Transpl 2004 Feb;10(2)(Suppl 1):S26-S29. 19. Ma CK, Zarbo RJ, Frierson HF Jr, Lee MW. Comparative immunohistochemical study of primary and metastatic carcinomas of the liver. Am J Clin Pathol 1993 May;99(5):551-557. 20. Wennerberg AE, Nalesnik MA, Coleman WB. Hepatocyte paraffin 1: a monoclonal antibody that reacts with hepatocytes and can be used for differential diagnosis of hepatic tumors. Am J Pathol 1993 Oct;143(4):1050-1054. 21. Johnson DE, Powers CN, Rupp G, Frable WJ. Immunocytochemical staining of fine-needle aspiration biopsies of the liver as a diagnostic tool for hepatocellular carcinoma. Mod Pathol 1992 Mar;5(2):117-123. 22. Mukhopadhyaya A. Hepatitis C in India. J Biosci 2008 Nov;33(4):465-473.